This Digital Thermometer Hygrometer is a battery meter for measuring relative humidity and temperature. The Thermometer Hygrometer can display three types of temperatures around the sensor's air via several convenient procedures: The ambient temperature, the dew-point temperature and the wet bulb temperature. 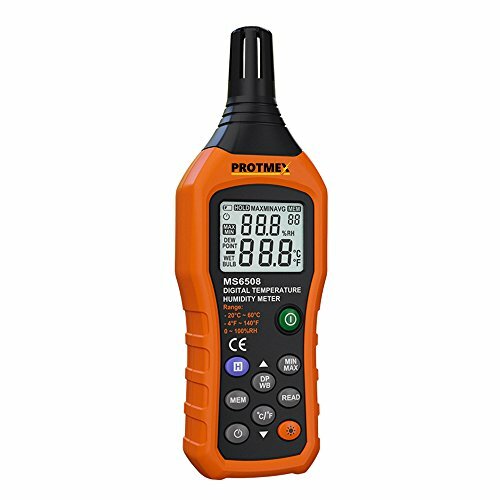 This MS6508 Digital Thermometer Hygrometer is a new type of digital temperature and humidity meter, which designed to combine the functions of humidity meter, temperature meter, wet bulb temperature and dew point temperature. And Dew point is a measure of how much water vapor actually in the air. Dual Display Humidity and Temperature with Accurate Measuring: Humidity range: 0% - 100%RH. Temperature range: -20℃(-4℉) - 60℃(140℉). Dew point Temperature :-50℃(-58℉) - 60℃(140℉). Wet Bulb Temperature:-20℃(-4℉) - 60℃(140℉). Multiple Function: With data retention, data storage, unit conversion, backlight, low battery indicator, automatic shutdown, maximum and minimum functions. If you have any questions about this product by Protmex, contact us by completing and submitting the form below. If you are looking for a specif part number, please include it with your message. Society6 Me & Paranormal You - James Roper Design - Ouija (white lettering) Duvet Covers Twin XL: 68" x 92"